I did love this book. It had adventure, espionage, politics and vivid depictions of one of the most inhospitable places on earth. Chinese Turkestan is somewhere no one much talks about these days. It is at the edge of everywhere; but that means it is also a place where various regions meet and mix. There have been waves of various people: Romans, Greeks, Indians, Mongols, Han Chinese, Russians, and all of these cultures have fought and sometimes, more excitingly, borrowed from each other and developed something new. It is also an area of extremes: the lowest place on earth (somewhere between the Gobi and Takla Makan deserts) are skirted by the highest mountains, and the summers are intensely hot, the winters intensely cold. There is no rain. It is the area of the world farthest away from any sea. Into this place, at the very end of the nineteenth century and the beginning of the twentieth, came a series of explorers. They were representatives of their empires, and apart from making important archeological discoveries they were also surveying and, it is suspected, spying. Some of them, like Sir Aurel Stein and Albert von Le Coq concentrated on extracting artifacts and taking them back for collections in their own countries; others, like Albert Grunwedel, frowned upon this and tried to concentrate on making records and preserving what was there. It was called 'The Great Game' as they all competed to discover first what was there. Along the way was trickery, mystery and the basis of many a real Indiana Jones story. Peter Hopkirk is an excellent story-teller, holding just enough back in order to reveal it later. It makes engrossing reading and I learnt a lot about the history of this place - both ancient and more modern, and made me eager to learn yet more. 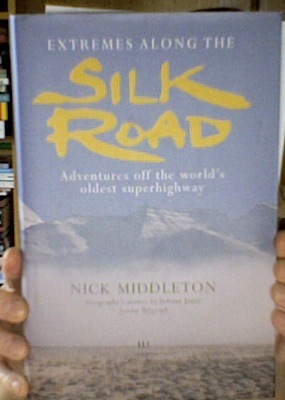 So now I am about to embark on another book: Nick Middleton's Extremes along the Silk Road. It is a book I bought about six years ago now in the Cheltenham Literary Festival. So I'm glad to have the chance, at last, to read it. You make it sound enticing, Clare--and the Silk Road is always an appealing subject, isn't it, so colorful and dramatic. I sometimes worry that I like too many things too much...or that people think that I do. It's just that when I do come across stuff that I don't think much of I just don't say anything...but this book is great (and actually the one I'm reading is too..dammit). 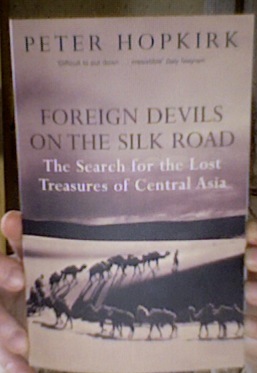 The Taklamakan Desert for the Desk-bound.